Roland was great. Very personable and accommodating. 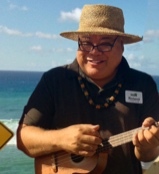 Enjoyed his company and his authentic perspectives of Hawaii and its culture (including its food culture!). You can't go wrong with Roland! -- A family from Peoria, Illinois.